Our young adults were just home for a family vacation and I finally had an opportunity to get their OK to give away many of their clothes stored at our house. Since they obviously were not wearing them on a daily basis, I hit the jackpot in the category of “Kids Clothes Left at Home.” Most of the items were from our youngest son who lives in Singapore where it’s summer all year round. I collected enough to give one item away for almost three months. It didn’t quite seem fair to count it this way, however, since even though I bought most of the clothes, they weren’t mine. (Besides this would make for some pretty repetitive photos.) I decided to compromise and count two for one. Thus for the next six weeks I’m giving away two things a day. 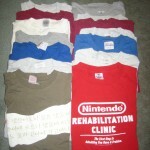 Even with this plan, however, there were too many T-shirts so I divided them into blank T-shirts and T-shirts with words. This week you see the shirts with words. 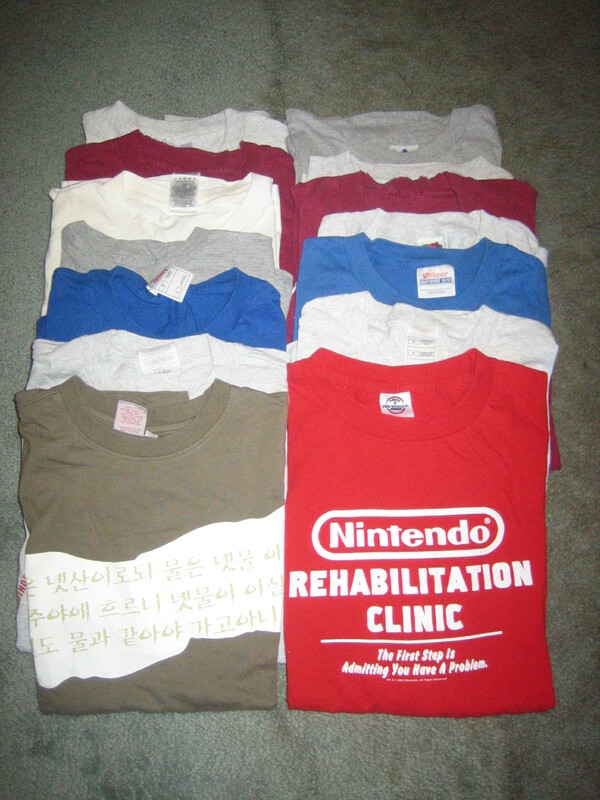 My favorite is the red “Nintendo Rehabilitation Clinic.” It’s also worth noting the one with Korean lettering. Anybody able to translate it?